National Signing Day was a big day for the Longhorns. Twitter reacted in its usual fashion with creative memes and GIFs. We collected some of our favorites from the day. When Houston Westside DT Jordan Elliott signed with Texas in the early afternoon, news of the Longhorns recruiting victory was all over social media, but it’s more fun to picture it like this scene from Braveheart. This was a popular meme after the Cavaliers fired David Blatt and hired Tyrone Lue, but this one is much more appropriate. Charlie Strong did the dab after Manor LB Erick Fowler picked Texas over LSU in the morning, but we figured that wasn’t the only dancing he did throughout the day. Five-star recruit Brandon Jones of Nacogdoches picked Texas over Texas A&M and Baylor. Jones met with Kevin Sumlin in late January. After Aldine Davis linebacker Jeff McCulloch, AKA The Shark, announced he was going to Texas over Texas A&M, College Station might have felt like this scene from Jaws. When Strong kept getting recruits, it was kind of like how the Longhorns kept scoring on Oklahoma. In-state recruiting sometimes feels like the fight scene in Anchorman. Strong was was busting recruiting boards at Baylor, Texas A&M and Oklahoma all day, just like the Kool-Aid guy does to walls. 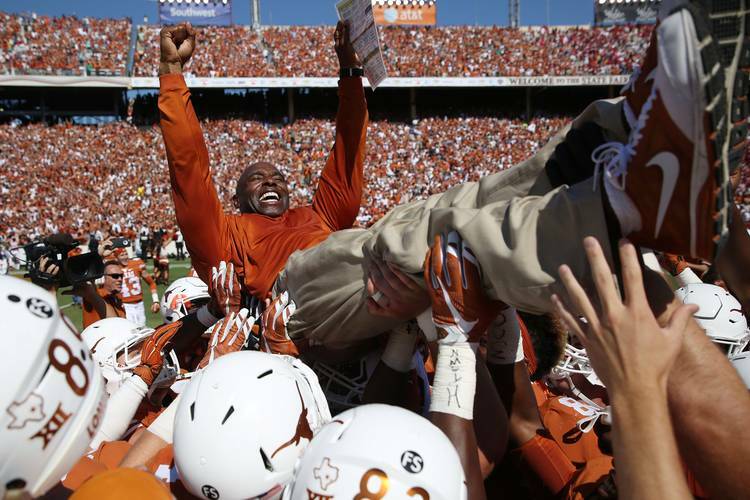 The Longhorn recruiting train steamrolled on National Signing Day. In head-to-head recrutiting battles, Strong ownedTexas A&M coach Kevin Sumlin as this meme points out.